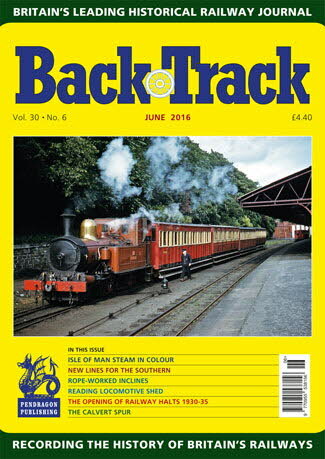 Railway Magazine | BackTrack June 2016 journal from Pendragon Publishing. Never a Dull Moment - A fireman's reminiscences of Reading WR shed as told by Richard Smith. The Closure of the Somerset & Dorset Joint Line: Part Two - Edward Gibbins concludes his investigation of the economic realties behind BR's decision. New Lines for the Southern - Jeremy Clarke looks at between-the-wars developments at Ramsgate, Allhallows, Wimbledon and Sutton. Rope-worked Inclines - Peter Hay recalls some mid-twentieth century survivors. Manx Sunshine - five colour pages of steam on the Isle of Man 1957-1970. Rules, Helping Hands and Short Straws - Glen Kilday dips into some LNER railway staff instructions. The Calvert Spur - An examination of this rail link and its impact on railway operations in Buckinghamshire by John Jarvis. In their Liverpool home - four pages of archive photos of Liverpool's termini and routes out of the city. Putting railways on the map - J. D. Bennett reviews some early railway atlases. The Opening of Railway Halts 1930-35 - Jeffrey Wells notes developments in the railways' search for new travel options. A Trip to Oxford - a 1935 excursion from Ripon to the Morris car factory in Oxford.